I wanted to have a Christmas tree this year but, with two cats looking for safe, high up places, one mobile baby batting at the lower branches and no inclination to fence off half our living room, an actual tree seemed like a bad idea. And I wanted my child to be able to play with it, whatever it was. I want her first Christmas to be as interactive as possible. 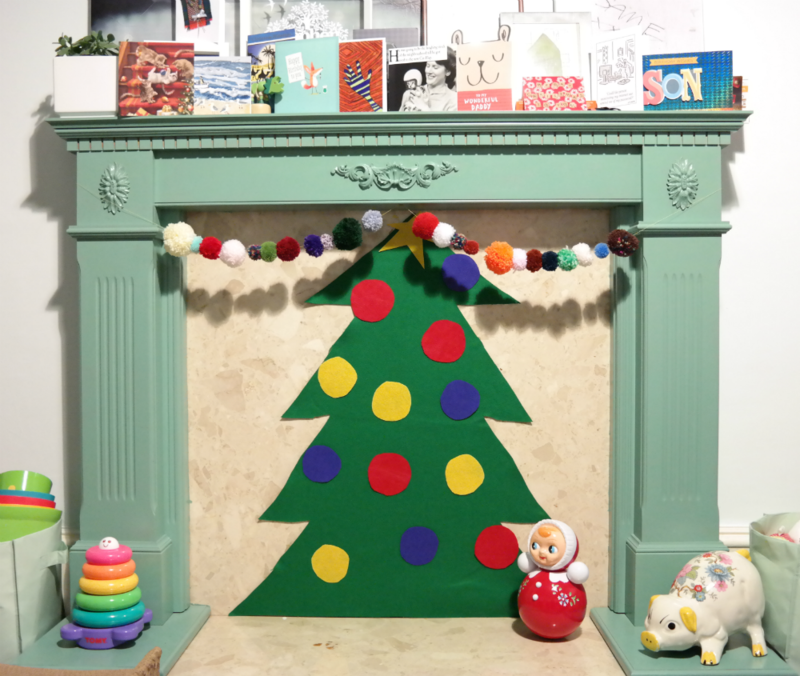 So: a felt Christmas tree it was. As ever, this is not entirely my idea. Check out my Christmas Pinterest board to see where I got my inspiration. This is such a simple craft I didn't take any photos of me completing it. If you feel like there's something missing, please imagine a photo of a pile of felt (with an artfully placed sprig of holly or similar on top of it) and another of a pair of scissors cutting into felt (artfully placed sprig of holly having been removed). What you do is: cut a Christmas tree shape out of a large sheet of green felt. It's easiest if you fold the sheet in half first and cut out the shape of half a Christmas tree - it will be nicely symmetrical that way. You could draw an outline on the felt first but I decided to freestyle. 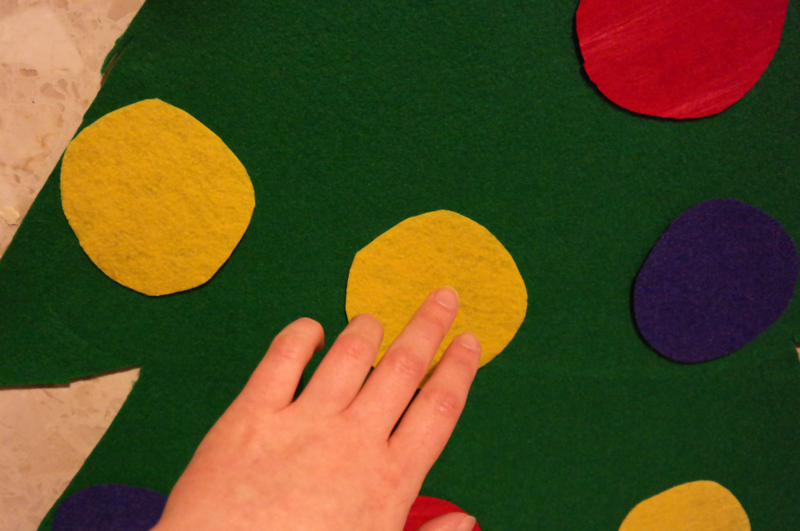 Next: cut out some circles from different coloured sheets of felt. Also a yellow star. Again: template/freestyle as you prefer. If my baby was a bit older, I would have spent time making pretty Christmas puddings and robins and more intricate baubles. But she's not. She's at an age where the felt was likely to end up in her mouth and I wanted to minimise the risk of her swallowing little pieces; also, she's not that into critiquing art. Stick your tree to the wall. I had a grand plan to use velcro but it turned out I don't have any. To my surprise, white tack did the trick. Alternatively, you could glue the tree to a sheet of cardboard. 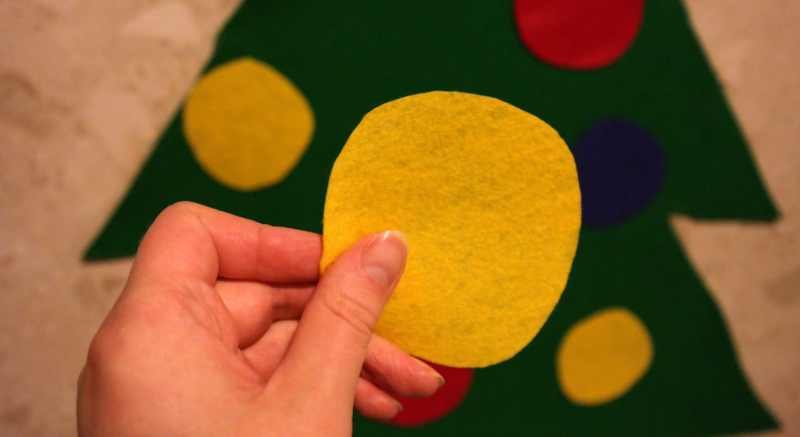 If you've ever played with Fuzzy Felt, you'll know that felt sticks to itself. 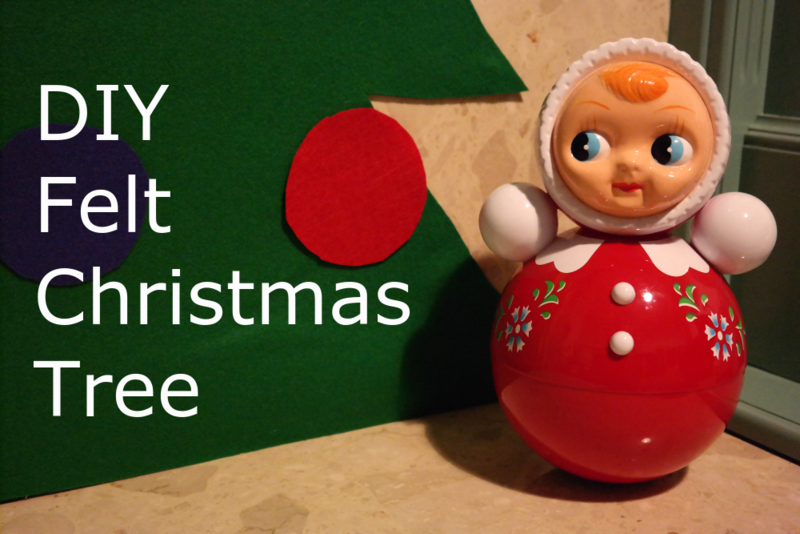 All you have to do is place your felt baubles on the tree and they will stay in place. They can then be removed, played with and rearranged as often as you and your child(ren) like. I didn't actually think MM would interact with this much - she's a bit young to "decorate" the tree. However, she quickly grasped that the baubles could be removed and quite enjoys taking them off so that we can pop them back on again. This is much more fun for her than I had anticipated. The great thing about this tree is that, after Christmas, it will fold up really small and can be put away for next year (when MM should be even more capable of playing with it). Do you have any Christmas decorations for your child(ren) to play with?